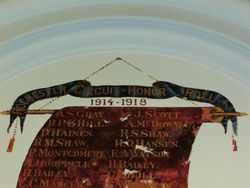 A honour roll commemorates those from the Rochester Methodist Circuit who served in World War One. 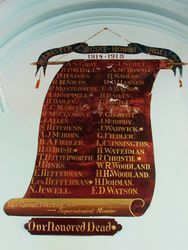 The roll is a work of art consisting of two honour rolls painted on the church wall. 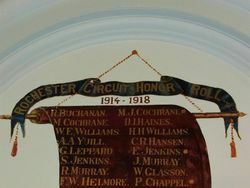 There was a crowded congregation at the local Methodist Church on Sunday night, whose interest centred in the unveiling of an Honor Roll, containing the names of the gallant lads of the Rochester Methodist circuit who have gone to the war. Lieutenant H. T. Downe performed the ceremony, and delivered a recruiting speech with fervor and effect. The speaker, during the course of his remarks exhorted the young women present not to have anything to do with a man who had not offered his services to his country. 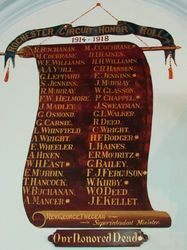 The resident minister delivered a fine discourse on the Australians' doings at Anzac, and the singing of "God Bless Our Splendid Men" was not the least feature of a notable function. There were about 60 names of town and country gallants on the Methodist honor roll, which is a work of art, designed and painted by a district artist, Mr. T. Sweatman, settler, of Ballendella. Bendigonian (Bendigo, Vic), 4 May 1916.